Cordoba Checkpoint from the stairs accessing Cordoba School and the Shuhada St Kindergarten. 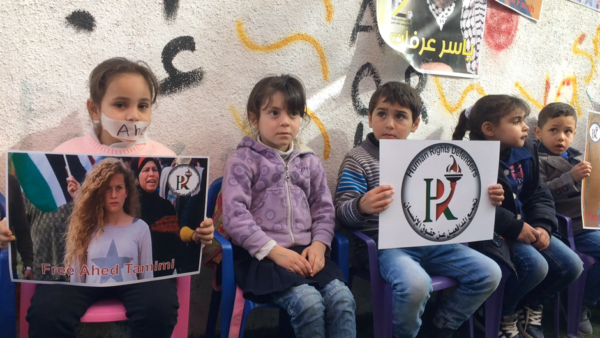 Human Rights Defenders organised a solidarity campaign with Palestinian Child prisoners at the Shuhada St. Kindergarten, on Sunday, February 4, 2018. The kindergarten is close to the Cordoba school in the H2 Israeli controlled area of al Khalil (Hebron). 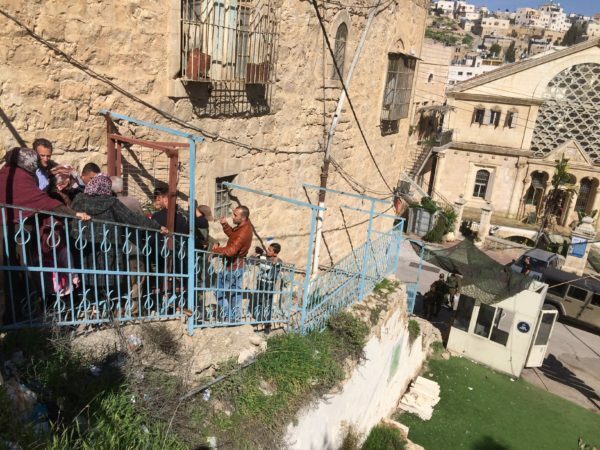 Both the school and the kindergarten have to access Shuhada St., down some stairs and through a military checkpoint. Half way up the stairs, there is a steel gate which is closed by a rope from the Cordoba Checkpoint on Shuhada St. Unnecessary delays and harassment often occur, at the checkpoint, on a daily basis. The event was a beautiful show of solidarity by the kindergarten children. 700 Palestinian children are detained, interrogated and tortured every year and, currently, 350 are imprisoned (Adameer). Various speakers described the plight of the children imprisoned as well as the terrible situation for the many Palestinians living in H2, and the determination of the Palestinians to stand strong. Badia Dwaik, from Human Rights Defenders called upon governments of the world to act against the illegal and immoral occupation of Palestine by Israel. (See the video) The event was run in conjunction with the Dismantle the Ghetto Campaign, which aims to mobilize people to engage in nonviolent activities and calls for the removal of checkpoints and the eviction of settlers from al Khalil/Hebron. Staff and teachers from the Kindergarten delayed at least 15 minutes. After the event, the children from nearby Cordoba School were allowed to leave through the Cordoba checkpoint. But, then, a settler ordered the army to stop the kindergarten children and staff from passing and the gate was shut. The staff and children were delayed for 15 minutes with no justification. 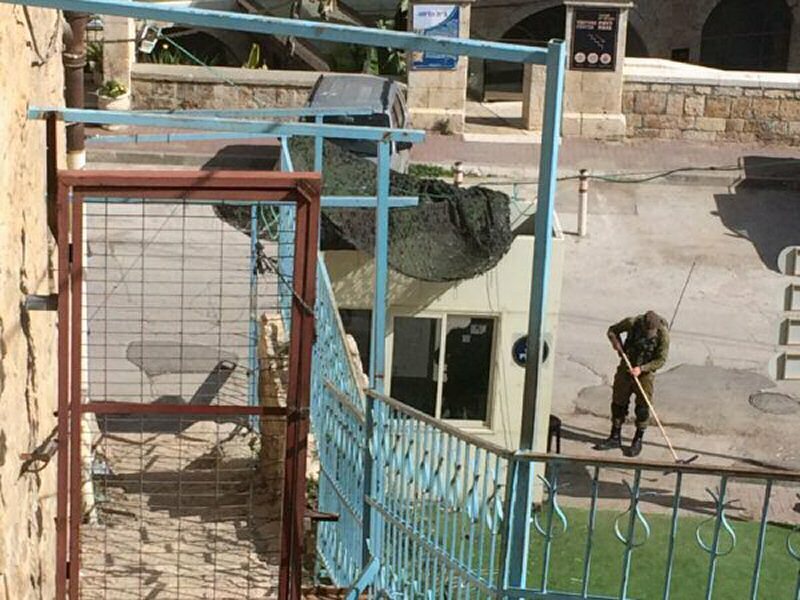 Such restrictions of movement, suppression of free speech, intimidation and harassment are common occurrences in al Khalil/Hebron. Aggressive settlers and the Israeli army work together to make life increasingly difficult for Palestinians in H2. The Palestinians are under increasing pressure, and some are forced to leave, but others manage to hold on in a beautiful demonstration of Sumud (steadfastness). More stories like this at the official website for the International Solidarity Movement (ISM).